I have a confession to make: I've never read a single X-Men comic. I've never watched the cartoon, either (just added to the top of my Netflix queue, though). Because I always have to see any and all event/superhero movies, I've seen all the X-Men movies. 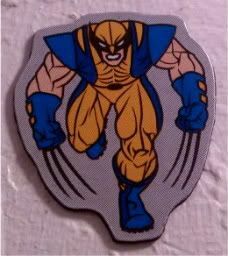 So, in my head, Wolverine will always be hot Hugh Jackman, not this guy right here. I'll go one further. Sometimes, comics make me crazy. It's kind of how I hate nonlinear storytelling - sometimes, the jumpiness of the panel layouts makes me nuts. I know. It's shameful. Especially since in about 10 hours, I'll be at New York Comic-Con. For the whole weekend. I think part of me knows that I just can't get into the seriality of it all - if I get hooked (which is totally possible and possibly scary), I'll be stalking Midtown Comics and Forbidden Planet all the time! But hey. I'm happy to entertain any suggestions for stories to try. After all, I can just run out on the floor this weekend and buy them. So, suggest away.